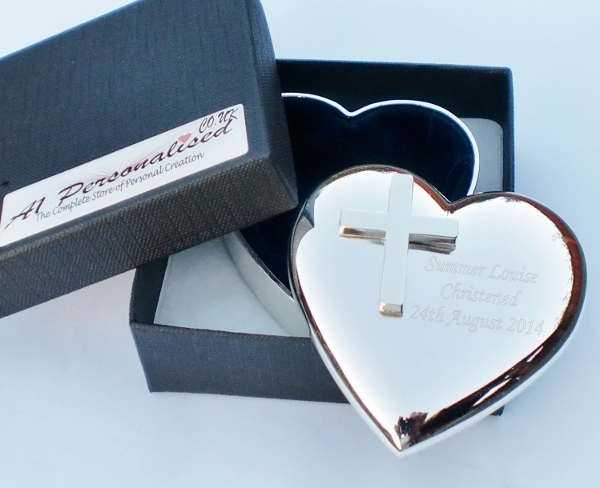 A beautiful engraved silver plated heart trinket box with cross embellishment. This amazing trinket box has a dark blue velvet lining and measures 67 x 66 x 30mm and come complete in a gift box. A perfect unique gift for Christenings, Baptisms, Godmothers. We do not have a character limit but please do keep your text to a reasonable length, if you have any questions regarding this please do not hesitate to contact us.